The good news is that there are ways to maximize the goodness of food through barbecuing so you get that hot-off-the-grill flavor while keeping it healthy! Read below for 4 quick ways to make barbecues as safe and healthy as possible. Choose grilled fish as opposed to meat. Salmon, trout and herring are full of omega-3 fatty acids that are great for your health but also are really tasty when barbecued. 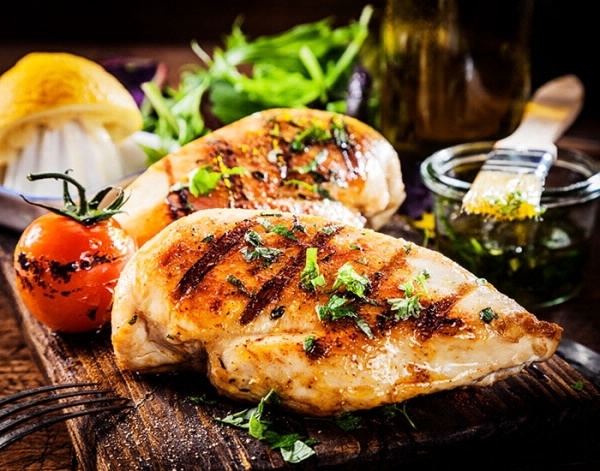 Also if you decide to have chicken, opt for breasts instead of the darker parts of the bird, as they are healthier when cooked in this way. Choosing a mixture of meat, fish and vegetables is the healthiest way to enjoy a barbecue. A simple way to reduce the amount of carcinogens in barbecued foods is to reduce the cooking temperature and leave the foods to cook for longer. Evidence shows that it is only meats that you cook above 162°C (325°F) that can produce carcinogens. Invest in a meat thermometer and make sure that the internal temperature of the meat is not above 70°C (160°F). Studies show that spices can inhibit the production of carcinogens so when you are preparing your marinade think about adding some chili powder to your chops! Garlic, sage, rosemary and thyme have all been shown to have similar beneficial effects so feel free to add as much flavor to your marinade as possible. Red wine is also full of antioxidants, which are well known for their protective properties and can add flavor. Finally, don’t marinate for too long (a few hours is sufficient) as this may lower the antioxidant potential. Add color to the barbecue by throwing your favorite vegetables on to the grill! You still get the irreplaceable BBQ flavor but without the carcinogens that you can get from meat. Vegetables are always a fantastic addition to any meal and a welcome side dish to go with the meat or fish that you cook on the BBQ. Have fun with it and make some vegetable kebabs, low fat garlic mushrooms, hot corn, grilled asparagus, marinated eggplant, baked potatoes, etc. So, with summer upon us and the sun finally shining bright, there is not a moment to waste! Get the barbecue out and enjoy all the goodness of grilled cooking in the fresh air with family and friends around a healthy barbecued meal! What are your tips for the perfect barbecue? Share with us in comments below, and make sure you share the article with your friends to inspire them for a great barbecue session.